Think making a game with The Beatles would be all gumdrops and lollypops? Wrong. Rock Band developer Harmonix was "terrified", says the studio's John Drake. Terrified in the sense that the developer did not want to screw up the game and piss off The Beatles. "I don't know what Apple was considering before they started working with us, and I'm sure that there were conversations on both sides," says Drake. "I think they saw that we were the company with the most reverence for what they were doing — we're not looking to turn a quick buck on The Beatles. This is something we've loved and respect and would not want to screw up. We were terrified while making the game, hoping we don't make them mad at any point — they're really nice and easy to work with, but this is The Beatles, you can't afford to mess this up." 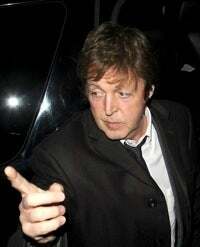 You do not want to make Paul McCartney mad. He will cut you.